It’s no secret if Apple is working on a new flagship smartphone with full-screen design, the iPhone 8. Smartphone will have a very thin bezel, and will look similar to Sharp Aquos S2. Trend full-screen design is booming carried by the world’s smartphone brands, including Apple with iPhone 8. According to reports circulating recently, iPhone 8 is said to have entered the stage of mass production, and some leaked photos that show the process of assembling the smartphone began to appear on Weibo site. 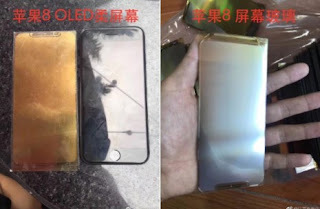 One of the most recent is the appearance of suspected photos as the front panel of the iPhone 8, where the display panel is a thin bezel around the edges, except for the top of which is still the place for the front camera and some other components. The leaked photo above also shows the digitizer and the display panel connector cable. If you look at the top of the panel, then you will see four holes and a gap for the earpiece. 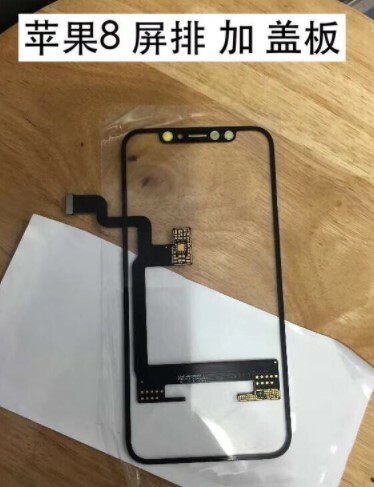 Well, for the hole on the right is allegedly going to be a selfie camera and the iris scanner, while for a small hole will be the proximity sensor and light and the hole on the far left looks like an LED flash. For other images show the connecting cable, Apple A11 chipset, and a screen that has been assembled. Although Apple has not announced when they will release the iPhone 8, but suspected if the smartphone will be announced in September.